Growing up in St. Louis in the ‘80s, I was obsessed with baseball. The Cards made the World Series three times and were led by Ozzie Smith, Willie McGee, and other household names. The sport felt pure, and salaries were still relatively low. While that vision of baseball was idealized, there’s something about the game that makes it easy to feel that way. That excitement is present on the face of Buck Weaver (John Cusack) in Eight Men Out. The third baseman for the 1919 White Sox dives for balls, flies around the bases, and celebrates each win like it’s for the championship. His team is also known for one of the game’s biggest scandals. John Sayles’ 1988 recreation of the events surrounding that year’s World Series shows both the joy and the greed that surrounded it. It isn’t as simple as fallen angels on the diamond, and he shows the complexities that make it so riveting. 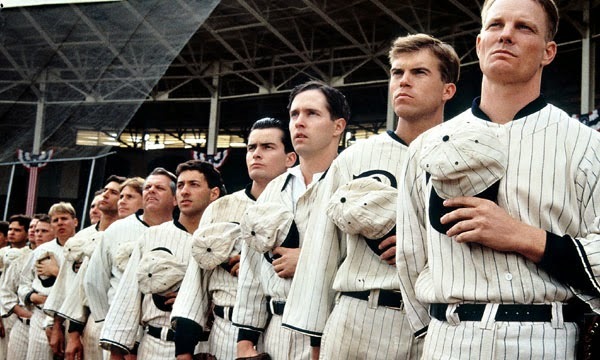 Sayles’ film is based on the 1963 book 8 Men Out by Eliot Asinof and does a brilliant job in explaining all the factions involved in throwing the World Series. The players are at fault, but they’re hardly the only culprits. Owner Charles Comiskey (Clifton James) orders the team flat champagne instead of promised bonuses and sits his star pitcher to keep him from getting one. In the time before free agency, the players had little power and barely made a living wage. The prospect of making $10,000 to take a dive was lucrative. Unfortunately, there was no incentive for the unsavory figures to pay the guys. Once they stopped playing on the level, they were doomed. The opening sequence is a master class in exposition and introduces the players without awkward dialogue. The fast-paced style includes a tremendous amount of dialogue and rarely takes a breath. Sayles packs in the information, yet it moves smoothly and doesn’t lose us. It helps to have actors like Cusack, David Strathairn, D.B. Sweeney, and even Charlie Sheen to make their characters unique. The players driving the deception are played by veterans Michael Rooker and Don Harvey as shady guys who just can’t help themselves. They’re itching to do something out of the ordinary and don’t even consider how obvious it looks to anyone paying attention. Once newspapermen Ring Lardner (Sayles) and Hugh Fullerton (Studs Terkel) start watching them closely, the gig is up. The baseball footage captures the excitement of being at the ballpark long before corporations took over the stadiums. 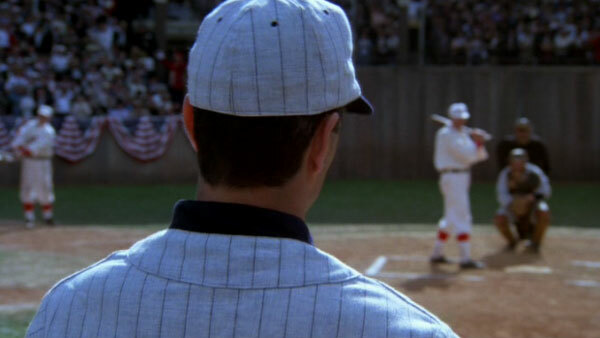 The actors’ skills aren’t always stellar, but the editing sells them as major league players. One of the most convincing is Sweeney as Joe Jackson, who just plays differently. He glides along the base paths and through the field like he’s walking on air. He’s not a smart guy, but he’s a natural on the field. Sweeney and Weaver are the collateral damage to the other players’ actions and guilty by association. If knowing about the fix is enough, they’re just as culpable. There’s a tragedy in seeing a sport that’s loved by so many tarnished by corruption, yet the personal stakes are even more impactful for these guys. Weaver is a shell of a man without baseball and will never be the same. There have been plenty of scandals over the years in baseball, including steroids, Pete Rose, corked bats, and racism. What makes the Black Sox stand out nearly 100 years after it happened? The main reason is the World Series, which sits on a plateau and creates legendary players. Even given all the scandals that have occurred, the idea that so many players would conspire to throw the entire thing is shocking. Another part is the era, which was even before the heyday of Babe Ruth and Lou Gehrig. It seems hard to believe that organized crime might have such control over baseball that early in its life. On the other hand, the legitimate guys running the game aren’t much better than the gangsters. The final act of Eight Men Out looks at the investigation and grand jury trial of eight players from the White Sox. This is hardly a situation where the big game decides their fate. Instead, they’re being tried in the court of public opinion right along with the real trial. Even when they appear to escape thanks to a high-priced lawyer, their victory is short-lived. It’s one thing to survive in their hometown with fans judging them; it’s another to face a stern commissioner looking to make his name. It’s an intriguing story that could easily cover three hours. What makes this film so much stronger is the fact that Sayles barely gets to two. He keeps the drama centered and doesn’t veer into unnecessary subplots. That focus allows us to fill in the gaps and still understand the stakes. It remains my favorite baseball film and one of the high points from Sayles’ fine career. Note: This review was written as a contribution to the Big League Blogathon organized by Todd Liebenow at Forgotten Films. Definitely one of the finest baseball films ever. A story that still holds up as it plays to that sense of corruption and kids facing disbelief that their heroes can let them down. Definitely. It works on so many levels and is sad, yet it never feels depressing. There's still that sense of joy about the game from the kids and certain players, despite the corruption that's everywhere. This is not as famous as the other great baseball flick of the 1980s, Field of Dreams, but surely should be. I mean, baseball plus courtroom drama? Priceless! And also John Mahoney. I love him. I'll try to take a look soon! 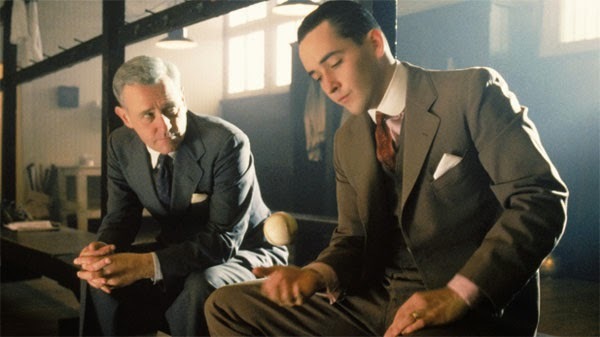 I totally agree about John Mahoney, who brings such heart to the coach. He's moment in the courtroom is fascinating because you can see he's conflicted about endorsing them but can't help it. I CANNOT BELIEVE I haven't seen this film! It sounds terrific. Must make this a top priority in life. Thanks! 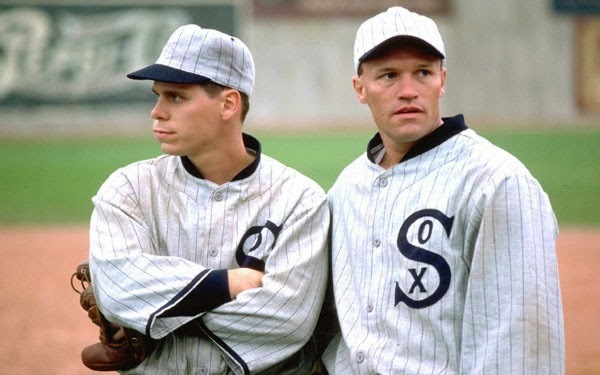 You should definitely check out Eight Men Out. I'd be stunned if it disappoints you. It deserves a lot more attention. As a big fan of baseball movies I really should have seen this but alas I haven't. I'll add it to my to-see list. Interesting dissection of the film Dan, a good read as usual. Dan, I'd definitely add this to your list. It has a great young cast and is such a different take on baseball and its history. Thanks!